A floating license works on a local network, such as an office or a university. 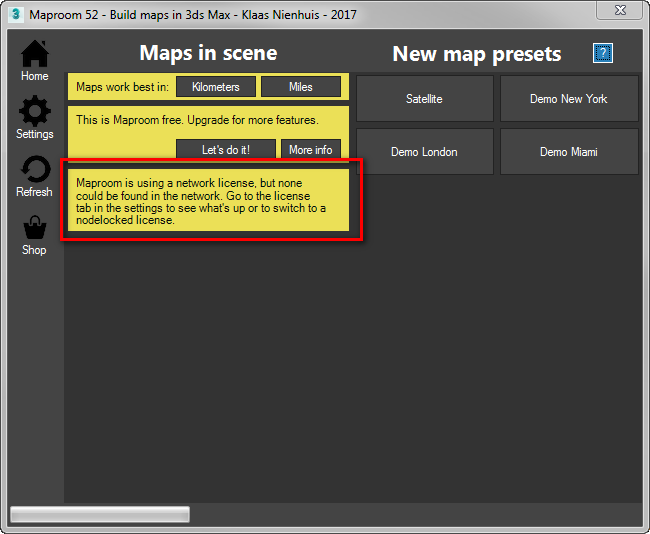 Each PC (client) on the network has maproom installed. One PC (server) on the network has a license server installed. This server can supply licenses to multiple clients. When a client starts maproom, it leases a license from the server. When this client closes maproom, the leased license is returned to the server. If for instance you have purchased 10 licenses, the server can hand out leases to 10 clients. If the 11th client requests a lease from the server, it’s denied. The number of clients on the network is infinite but only 10 of these clients can lease a license at the same time. All other clients operate with a free license. A floating license can’t be purchased from the shop yet. Get in touch with me at mail-at-klaasnienhuis.nl to set it up.